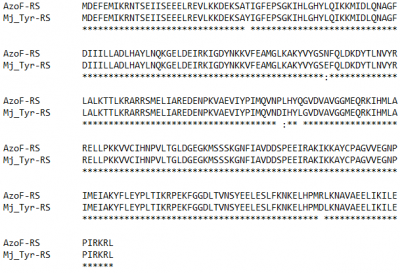 This part codes for an aminoacyl-tRNA synthetase (aaRS) for incorporating phenylalanine-4‘-azobenzene (AzoF) at the amber stop codon. Figure 1 shows the CDS of the AzoF-RS in a matching expression cassette, based on the ONBY-part (BBa_K1416000) in pSB1C3. 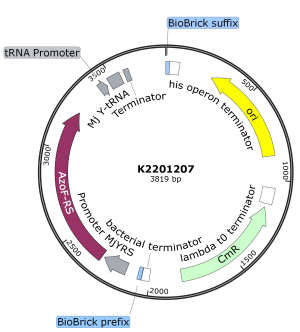 Figure 1: Plasmid map of the BioBrick K2201207 coding for a AzoF-tRNA-synthetase system based on the ONBY-Part (BBa_K1416000). The ONBY-RS was removed by PCR and then a gene containing the AzoF-RS and matching overlaps sides was integrated through Gibson assembly. This part is based on a selection experiment on the M. jannaschii TyrRS to evolve a new aaRS capable of incorporating the photoisomerizable phenylalanine-4‘-azobenzene (AzoF) by the Schultz lab. Figure 2 shows a sequence alignment of the protein sequences of the native M. jannaschii TyrRS and the AzoF-RS after the selection process. Figure 2: Alignment of the protein sequence of the AzoF-RS and the M. jannaschii TyrRS. Phenylalanine-4’-azobenzene is an amino acid-derivate with a photoisomerizable azobenzene moiety. Upon irradiation with a wavelength between 320 – 340 nm it switches from its more stable trans into its cis isomer due to the rotation around the N-N bond (Figure 3). The cis to trans isomerization can be thermally induced or occurs after irradiation with a wavelength > 420 nm (Figure 3) (Zimmerman et al., 1958; Bose et al., 2006; Brieke et al., 2012). We used our self-constructed LED panel to successfully switch the conformations of AzoF. Figure 3: Structure of AzoF in cis- and trans-conformation. Switching is possible via irradiation. Naturally a solution with AzoF contains a mix of these conformations with the more stable trans-conformation in excess. By irradiating the solution for 40 minutes with our LED panel at 100 % brightness, the amino acids can be switched to one of the distinct conformations and so mediate different properties to the protein they are incorporated in. The switching process can be observed by the different absorption specters of the two AzoF conformations (Figure 4). We were able to switch AzoF to the trans-conformation with blue light (465 nm) and to cis with UV-light (367 nm). The conformations are stable for several hours and can be switched back and forth until the amino acid degrades. Figure 4: Absorption spectrum of AzoF in LB media after irradiation with light of 367 nm and 465 nm wavelength. 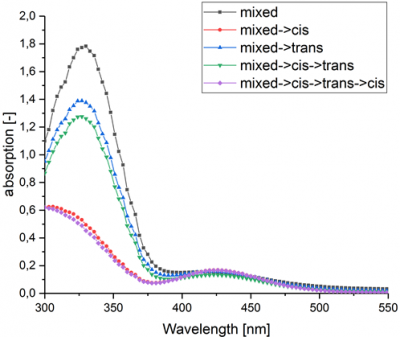 The black line shows the typical absorption of AzoF in a mixed state, the trans-conformation is blue and green and the other lines show the absorption spectrum in the cis-conformation. Figure 5 shows the effect on the lycopene production based on the incorporation of photoswitched AzoF. The trans-conformation seems to favor the binding activity of the active site, while the cis-conformation seems to reduce the binding activity. 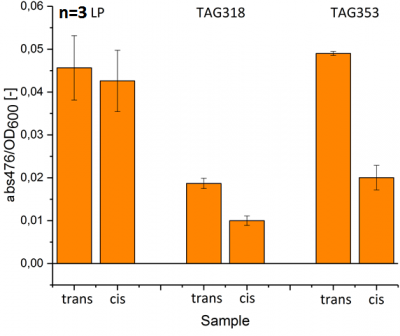 The highest difference in the lycopene production is present at the TAG353 variant. Here the cotransformant shows a lycopene production similar to the unmodified lycopene producer when cultivated with trans-AzoF while the productivity is reduced to nearly a third when cultivated with cis-AzoF. The AzoF-variants do not seem to influence the lycopene production when no amber-codon is present in crtI. Concluding, we provided strong evidence that that the observed difference in lycopene production in the three variants is caused by the incorporation and photoswitching of AzoF through the AzoF-RS. Figure 5: Absorption at 476 nm (indicator for lycopene) normalized to the OD600 (indication for the cell density) to calculate the relative lycopene production of each crtI variant cultivated with AzoF in cis- and trans-conformation. The pEVOLpAzF is available at request at CU Boulder, Bielefeld CeBiTec or addgene. For further use we recommend to clone the CDS of the AzoF-RS into a low copy plasmid like pSB3T5 or in a high copy plasmid like pSB1C3, shown in the design section. The characterization was done in p15A.